As with its competitors, the N Line badge will represent a mix of different enhancements, ranging from largely cosmetic to serious performance. The Elantra GT N Line falls somewhere in the middle. 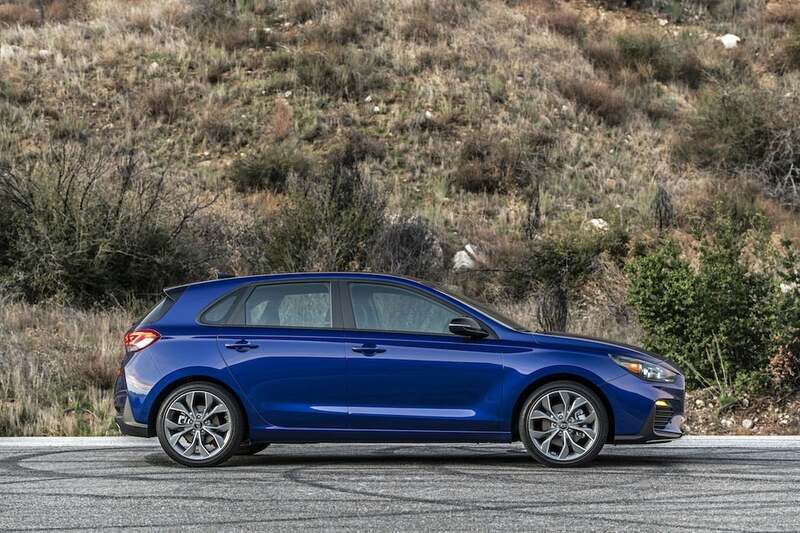 The N Line version of the Elantra GT offers tighter steering and a more responsive ride. 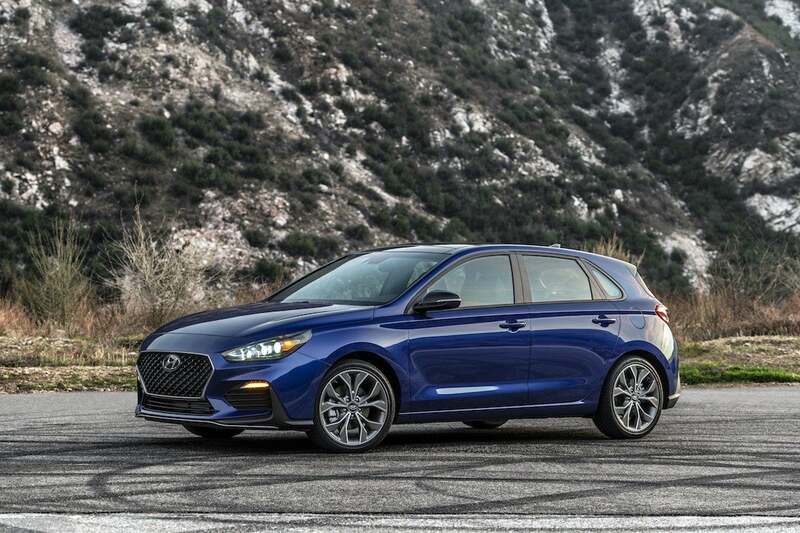 While it retains the stock Elantra hatchback’s powertrain, the GT N Line gets enhancements that should make it quicker, especially on a track or tight road course, including quicker steering, a stiffer suspension, more robust engine and transmission mounts and bigger brakes. Add plenty of cool appearance upgrades, including unique front and rear fascias, seats and a leather-wrapped steering wheel. The Korean carmaker notes that the engine mounts are 6.3% stiffer, the transmission mounts 24% stiffer, than the stock Elantra GT. 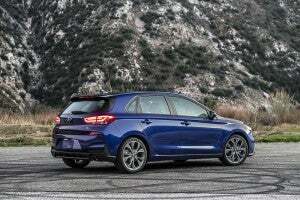 The same goes for the springs and stability bars, while the shocks and steering have been recalibrated compared to the everyday GT which was already the sportiest version of the Hyundai Elantra. Then there are the 18-inch Michelin Pilot Sport summer tires – which are the only rubber available with the six-speed manual gearbox version of the GT N Line. The optional gearbox is a seven-speed DCT which is paired to the 1.6-liter turbo I-4. The powertrain makes 201 horsepower and 195 pound-feet of torque. 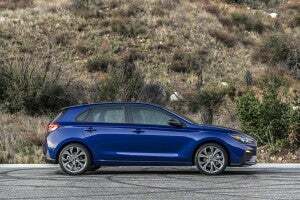 The new Elantra GT N Line gets stiffer engine and transmission mounts. It’s not all work, however, the sport model also adding heated leather seats, as well as distinctive interior accents like N logos and red contrast stitching. As with the standard-issue Hyundai Elantra GT, the hatchback is offered with an optional 8.0-inch navigation-based infotainment system. What’s next for the U.S. version of N Line isn’t clear, though few would be surprised to see the Veloster model follow. 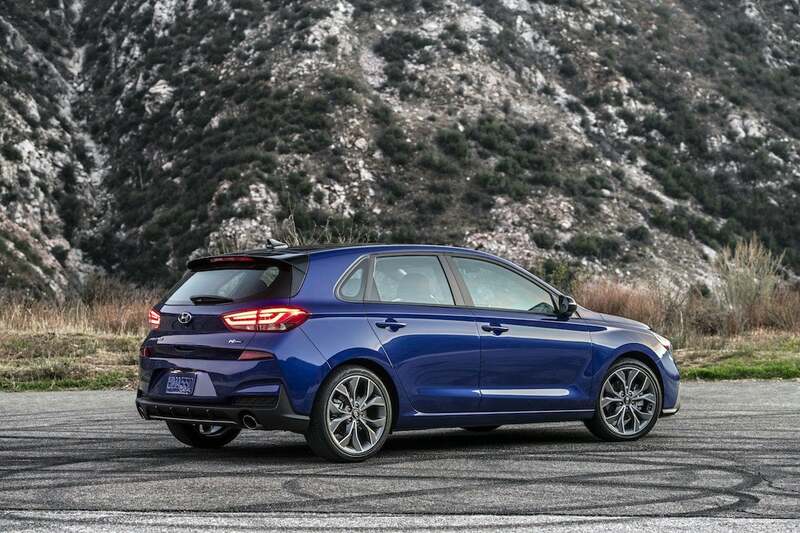 Clearly, Hyundai is hoping to follow in the tire tracks of key competitors such as Honda and Subaru in appealing to the sport tuner crowd, and the arrival of the 2020 Hyundai Elantra GT N Line will give us a sign of whether its new brand-within-a-brand gets taken seriously. Pricing for the GT N Line starts at $23,300 for the stick shift model, the DCT adds $1,100. Those figures don’t include another $885 in delivery fees. This entry was posted on Monday, January 14th, 2019 at and is filed under Auto Shows, Automakers, Automobiles, Business, Detroit, Executives, Hyundai, Markets, Personalities, Sales, Sales, Sedans, Sports Cars, Trends, U.S./North America. You can follow any responses to this entry through the RSS 2.0 feed. Both comments and pings are currently closed.